We only had two days, so the agenda was simple- to be lured in by brands and booths that spoke to us. Expo East is smaller and more intimate than Expo West, but there are still many gems to be found in new companies exuding confidence and creativity or with mid to larger-size brands with new products and news. The main message: get a dose of nutrition, while enjoying the foods you eat every day. Why eat empty calories when you can drink your greens, sprinkle on protein and snack on probiotics? Choose foods that can work harder for you while being tasty too. This picture seems to capture the spirit of the Natural Products show: pure positivity, a community of like-minded people who work together to bring healthy minded consumers brands they can believe in. I was happy to be walking by Justin’s to help celebrate their big moment- winning a “Best of East” Press Awards for their Honey Peanut Butter + Banana Chip Snack Pack! 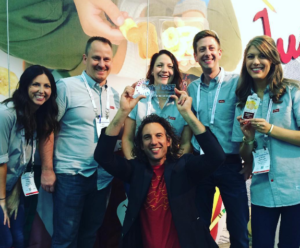 The future looks very bright for Justin’s, check out the news about the deal with Hormel here: Justin’s partners with Hormel. We have reported some great brands from Canadians these past couple years. 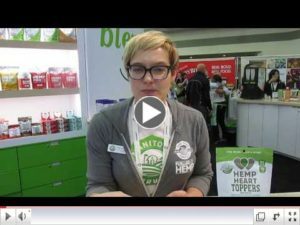 Here’s another, from Manitoba Harvest Hemp Foods… Hemp Heart Toppers. Sprinkle over cereal, mix into your yogurt, top a bag of popcorn, or even season your baked potatoes to add a bit more protein, omegas and fiber to your daily diet. Check out our chat with them above. 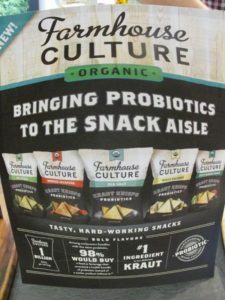 Farmhouse Culture, known for their probiotic Krauts and Gut Shots , debuted their newest products, Kraut Krisps. These ‘hardworking’ snacks offer probiotics with every bite- the dill pickle flavor was so zesty and tangy it was hard to eat just one! 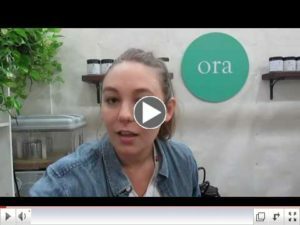 We had a chat with Erica, who explained that “Kia Ora” is a greeting commonly used in New Zealand, meaning, literally… “be well/healthy”. It’s always nice when a brand has a sincere story behind its name. These delicious probiotic & prebiotic powder supplements are made from plant-based organic foods and have playful surnames like “trust your gut”. And congratulations Ora for winning the Editor’s Choice award for Best New Supplement, well done! The juice market has gotten super crowded, but something about the “Daily Greens” presentation made us stop and take a sip. This Austin based, organic cold pressed green juice company was founded by avid juicer and breast cancer survivor Shauna Martin. 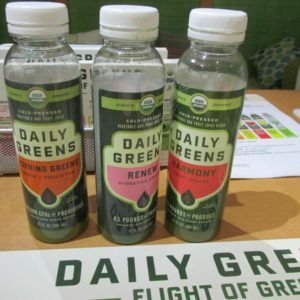 The equivalent of 7 USDA servings of vegetables and fruits is pressed into every 12-ounce bottle of Daily Greens- that’s 4.5 pounds of certified organic and non GMO produce! There’s a line of “Just” (carrots, greens and beets) as well as their new “GREEN ADE” line-with blue-green algae, chlorella, and spirulina. And it’s great to know that a portion of sales is donated to organizations that assist young women battling breast cancer, bringing the mission to life in a truly effective way. In Scandinavia and Eastern Europe, birch sap has been enjoyed for centuries. 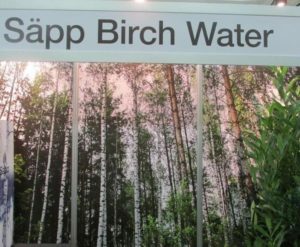 Säpp Birch Water is an EU & USDA organic offering two unique herbal infusions, one with leaves of nettle and another with berries of rosehip, plants unique to where they harvest the product. They also make sure not to use the same tree two seasons in a row: sustainability and simplicity are at the core of their value set. And the market looks anything but sappy-check out the stats on this new market for healthy hydration. Remember, ten years ago, the coconut-water market was negligible. It is now worth $1bn in North America and Europe. Financial Times on birch water market . This brand oozes authenticity. That came through in my chat with the founder, Joel. When he was only 8 years old, he went around selling pancake mix in a little red wagon. Today, he operates a boutique baking mix company with a memorable big bear the package. The brand’s woodsy, lodge-feel puts you in the mood to fire up the grill for some hearty pancakes to help you conquer your day. The mixes are made with 100% whole grains for high protein, good fiber, and solid fun. 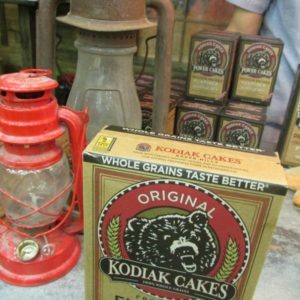 For an update since their appearance on Shark Tanks, click here: Kodiak Cakes investment. Thinking about where to take your brand next? joyful plate would be delighted to partner with you on your next strategy project! Think of us as your extended management team to prepare your story for investors, imagine and research new product concepts and maintain brand image and relevancy. with NEXT Data & Insights, (A Division of New Hope Network: Proprietary data, intelligence and insights into what’s next in Natural). © Joyful Plate. All Rights Reserved.